How Private Security Companies Help Citizens Stay Safe | COP Security, Inc.
Posted July 13, 2018 by barton_secure & filed under Security Guards. Private security companies like C.O.P. play an important role in keeping us safe. The police cannot be everywhere at all times. Therefore, private security helps fill their role of watching over people and making sure the peace is kept at places like banks, community pools, churches, shopping centers, offices and other places people live, work and play. Security guards are good to have around in case something dangerous or bad happens. Trained to perform several procedures, guards being present might mean the difference between life and death for a person or a group of people. It’s important to have visible security so that people who want to do others harm know they’re being watched– and if they know this, they’re less likely to commit crimes or harass people in the vicinity of guards. Meanwhile, guards are a set of eyes and ears on the lookout for anything out of the ordinary or suspicious going on– and can report people to the police, if needed. 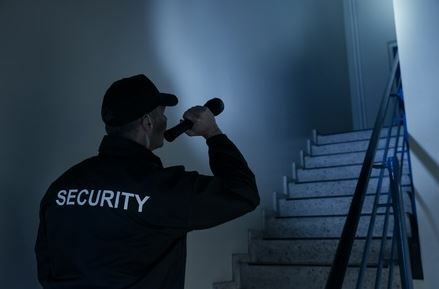 Security guards can do random walks around properties to “surprise” those up to no good. On foot patrol, they might notice fires starting, obstructions in the way that could hurt someone (like a fallen tree branch), or a person who has fallen to the ground and can’t get up and needs help. Also, guards often utilize video surveillance technology to take a bird’s eye view of an area– focusing on anything that seems out of place or abnormal. By doing this, reports can be made of what happened where at what time– tracking people’s movements and whereabouts, which could come in handy in courtroom matters and such. If a security guard sees a crime being committed, they can make a citizen’s arrest. Not only can they detain the suspect, but also call the police on them. Guards are also important to have around for emergency situations, when people are looking for a leader to take direction from– a guard is trained to be reasonable, calm, matter-of-fact, and to take care of business even when others around them are scared out of their minds. With all the violence in the world today, including bomb threats, terrorist attacks and school shootings, private security companies are more in demand than ever. There are a lot of people to watch over in this world! If you’re looking for reliable security guards in the Rochester, NY area, contact COP Security today.